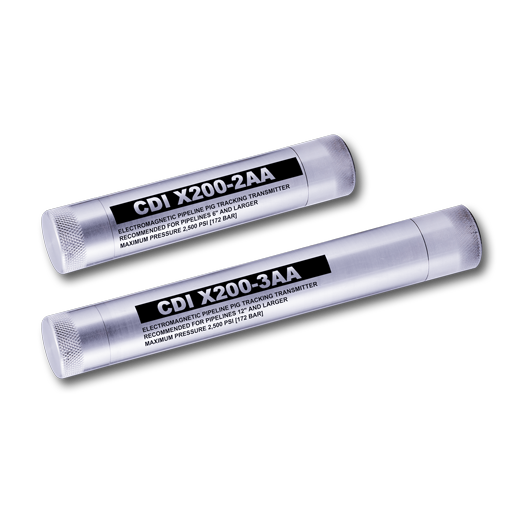 The X200 transmitter family are CDI’s small-sized TRAXALL compatible electromagnetic transmitters. This family consists of two transmitters which house either 2 or 3 AA-Cell batteries. These transmitters have both user-adjustable frequency and output power through the use of CDI’s FieldLink wireless communications system. Using CDI’s TRAXALL transmitters, an operator may have direct control over battery life vs. strength tradeoffs. Short pig runs can go for maximum power and long pig runs can be more conservative with pulsing modes and/or reduced power.